The first thing any good spy will want to do when checking into his hotel room will be to check for listening devices. To do this you will need a bug detector. There are a wide variety of Bug Detection and Listening Devices. This Detective Pen is used for finding audio bugs and mobile's broadcasting within a 1 to 10 meter vicinity. The Pen's unique design makes it flash faster and faster the closer you are to the transmitting bug or mobile. With a professional design, this covert detecting pen will provide privacy protection from audio transmitting bugs, wherever you happen to be. 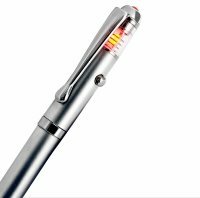 Very portable, this pen will not only will detect transmitting signals from audio spy bugs and mobiles, but is actually a working pen you can write with. It's also smart enough to marry up with your fancy pen collection. Electronic Counter Surveillance is another technical description. To most of us, the phrase would be Bug Detection. As most bugs operate by emitting radio frequencies, a bug detector is simply a radio frequency receiver. Admittedly, few of us will experience the need to scan our hotel room for bugs, but a very serious threat to all of our security is of course internet hackers, spammers and hackers. Currys / PC World have all the latest software.